Alcatraz was the "supermax" federal prison of its day, a far cry from its modern, heavily fortified equivalent in Florence, Colorado with motion detectors and cameras, 1,400 remote-controlled steel doors, pressure pads and twelve-foot-tall razor wire fences. People have all kinds of ideas about Alcatraz Island and its prison. Many of them are wrong. These are a few of the most interesting (and true) facts about "The Rock." Alcatraz means "strange birds" or pelicans, according to the Bureau of Prisons website. In 1775, Spanish explorer Lt. Juan Manuel de Ayala (who first mapped the San Francisco Bay) named it the island "de los alcatraces." It wasn't always a prison: It was initially a fort, declared a military reservation in 1850 by President Millard Fillmore. In 1859 (two years before the Civil War began), troops moved in to defend the Bay Area. In 1907, Alcatraz became an official U.S. military prison and remained one until 1933, when the facility transferred to the Bureau of Prisons. Some of its earliest prisoners were protesters: In 1895—back when Alcatraz was a fort and not a prison —19 Hopi Indians were imprisoned on Alcatraz because they refused to farm the way the government told them to and were against their children's forced education in government boarding schools. Learn more about it at the National Park Service website. Cells were smaller than a closet: In B & C blocks, the cells were 5 feet by 9 feet, with a sleeping cot, a toilet and small sink (cold running only). By comparison, today's walk-in closets are about 6 feet by 6 feet, or bigger. Alcatraz has great gardens: When Alcatraz was an active prison, its officers and their families planted gardens. The hardy plants they chose survived decades of neglect after the prison closed. That is until 2003 when Gardens of Alcatraz partnered with the National Park Service to restore and maintain them. They offer guided tours of the gardens a few days a week, taking visitors to Officers’ Row and the Rose Terrace, which are off-limits to other visitors. Learn more about the gardens and tours at the Gardens of Alcatraz website. Alcatraz is a birdwatcher's bonanza: In other places, you'd have to peer at nesting seabirds with binoculars, but on Alcatraz, it's easy to get much closer. Among the species, you'll see are cormorants, orange-footed pigeon guillemots, snowy egrets, black-crowned night herons, and Western Gulls, the island's most numerous bird species. If you're a serious birdwatcher, you can get more information about seabirds on Alcatraz on the National Park Service website. Families lived on Alcatraz during its prison years: The guards and officers lived on the island with their spouses and children. There's even an Alumni Association for folks who grew up there. Prisoners actually did escape from Alcatraz. While it was a prison, 36 tried to get away. Of those, 23 were captured, six were shot and two drowned. The other five went missing and were presumed drowned. But before it was a prison, Alcatraz was a military post. According to the National Park Service history of Alcatraz, imprisoned soldiers who went on work assignments to mainland army posts sometimes just walked away. The website SF Genealogy says another enterprising inmate simply forged a transportation permit, got on a boat and left. It Was Never Full: The average number of prisoners was 260, but as few as 222 and as many as 320. Alcatraz Didn’t have a “Death Row” nor any facilities for executing the death penalty, but a few prisoners did die while imprisoned there. Eight people were murdered by other inmates on Alcatraz, five of them committed suicide, and fifteen died from natural causes. Deaths were so infrequent that the morgue was a makeshift-looking place which you can see during your tour. 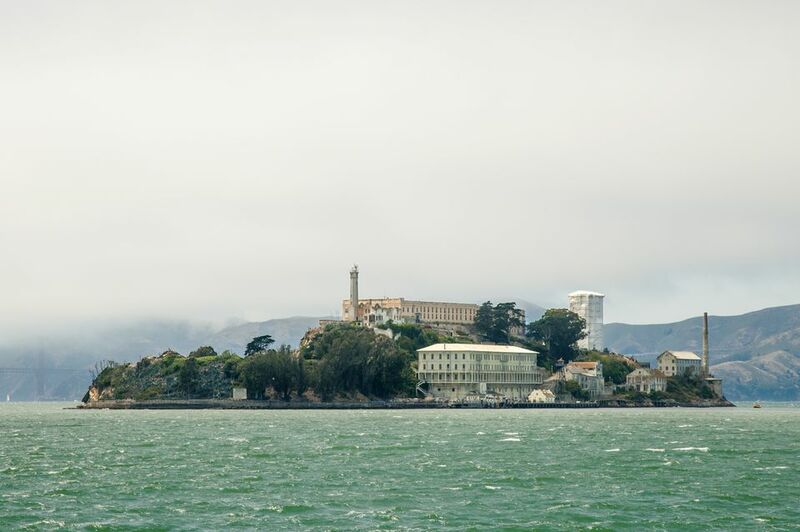 Alcatraz might be haunted: There are reported paranormal occurrences, including one that suggests Al Capone might be among its "haunts." It has a lighthouse: In fact, it was the first West Coast lighthouse, activated in 1854. It helped guide ships in the San Francisco Bay until the early 1900s when a new building on the island blocked it from the view of arriving ships. More about Alcatraz lighthouse. If you can't get enough of facts like this, you might enjoy The Secrets of Alcatraz by Susan Sloate. If you're planning to visit Alcatraz, you'll find lots of practical, expert tips in the Alcatraz Visitor Guide. You can also take a little tour ahead of time here.